“Ruslan can reflect on a stellar career. He’s made it very far in our sport, but his best days are well behind him. 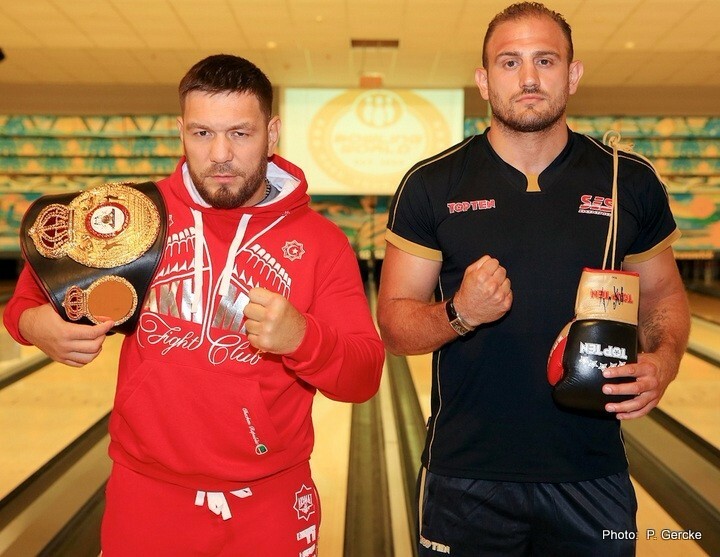 It’s highly doubtful he’ll ever reproduce these performances, so I’m giving myself a good chance to win this fight,” says the likeable 30-year old cancer conqueror in an exclusive interview to Profiboxing.cz. How much do you appreciate the fact that this is going to be your second title fight in as many years? This is a great honor for me. I want to thank my promoter Ulf Steinforth, my trainer Dirk Dzemski and the whole team for helping me to reach this point. And of course, I thank God for all opportunities that He is giving me. How big of a learning experience was your fight against Wladimir Klitschko? What positives did you take from that bout? Obviously fighting against Wladimir Klitschko has been a huge thing for me. I felt well going into the fight and I gave my best. It just wasn’t to be. Wladimir was the better man that night and I had to accept it. Now I hope that God will give me the power to finally achieve my goal Saturday night and become Heavyweight Champion of the World. Your fight against Chagaev will “only” be for the WBA regular title. Many fans don’t take this belt very seriously. What would be your message to them? Do you view this fight as a certain challenge to earn yourself a second shot at Wladimir Klitschko, the current WBA super champion? We are fighting for the WBA World Heavyweight Championship. That’s all that counts for me. I don’t care what anybody else is saying. Ruslan Chagaev is a two-time World Champion. He won the belt the first time by beating Nikolay Valuev and he won it back last year against Fres Oquendo. I know that per WBA rules the World Champion has the right to fight against the Super Champion. But that doesn’t count for me. First things first. I only focus on the fight. And then we’ll take it from there. According to many observers, the last three years marked a steep decline in Chagaev’s ring performances. Do you view it the same way? Do you consider yourself as the favorite coming into this fight? Ruslan Chagaev is a very good and experienced boxer. He had his ups and downs but I will surely not underestimate him. He is the champion, I am the challenger. Everything else remains to be seen. We will have an answer to these questions Saturday night. Apart from that, he’s also said that he’s going to dedicate his win against you to the memory of his deceased trainer Fritz Sdunek. Did you have the chance to meet Fritz in person? How much did the news of his death affect you? I have known Fritz for a long time even though I was never really close to him. He is a legend and his passing was a shock for the whole boxing world. May he rest in peace. Of course, losing Fritz was extremely difficult for Ruslan who was training with him. Chagaev may currently be on the decline, but he can still count on his vast experience – be it from the amateur or professional ring. Do you view his experience as his main advantage coming into this fight? Of course! The experience is something you can never take away from him. And I cannot make up for that because I haven’t been World Amateur Champion. Still I believe that I have a good chance of winning the title. He is without a doubt one of the best heavyweight fighters of his generation. His win over Valuev was sensational. He showed a great and masterful performance. But his big fights and big wins have been a couple of years ago and nobody knows if he is still capable of showing such great fights. Did you spar against southpaws in your training camp? And if so, who were those fighters? Of course, to prepare for a southpaw opponent you have to spar with southpaws. One of my sparring partners was former World Cruiserweight Champion Firat Arslan who is still in tremendous shape. It was very helpful for me to work with an experienced fighter like Firat who has known Ruslan for a long time. What would it mean for you to win the title in this fight? I am not thinking too much about winning the title and what it would mean. I focus on the fight and what I have to do in the ring. Before I faced Wladimir I promised my little son to win the belt for him. I would not do anything like that ever again – even though my son was not disappointed that I couldn’t keep my promise. Hopefully I will be able to keep it by bringing home the belt Saturday night. Your fight against Chagaev will headline a card that is composed entirely of heavyweight bouts. How much do you like this idea of heavyweight cards only? And also, how much do you look forward to it? This is a big event but to be honest I am not thinking about the undercard or anything else but my fight against Ruslan. This being said I am happy for my stablemates Michael Wallisch and Tom Schwarz who are fighting on the same event. It will be a huge show. Everybody loves to see heavyweights because we have tremendous power and every punch can decide the fight. So I am sure that boxing fans love the idea of all-heavyweight nights. The ticket prices for this event have been fairly low. Hence, do you expect a sellout crowd cheering for you in this fight? Do you even pay any attention to the atmosphere in the stands when in the ring? As far as I know ticket sales went very well even though it is a hot summer and people usually like to spend their evenings and nights outside when it’s very warm. I am pretty sure that it will be an electric atmosphere and I am looking forward to a great show.